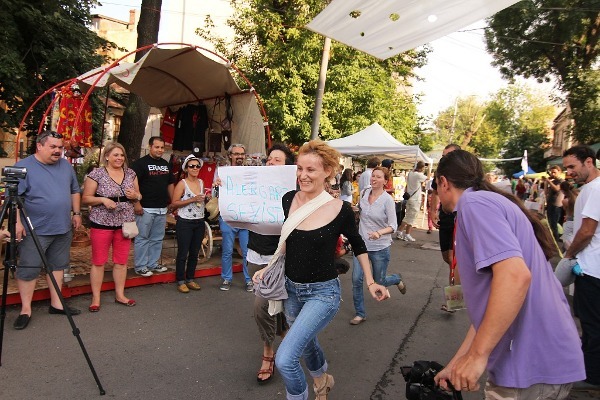 One of the attractions at Femei pe Mătăsari was a run in high heels, at which everyone was accepted (including guys) with a single condition: to wear high heels. Not even the height was an issue, participants were split in groups based on the heel size. In the middle of this was also a small group of feminist fundamentalists, protesting and calling such thing “sexist”. They were a few and people pretty much ignored them, initially I didn’t even thought about taking a picture of their group, but when noticed I accidentally have one changed my mind, better talk about issues than keeping them covered.